David Cargill was the owner of Dundee Bleach Works which, during the 1860s, more than trebled its number of employees to 350. The business later expanded to also become yarn spinners and merchants. David Cargill took on the operation, along with George McKenzie, of the Dundee Bleachworks in 1851, in which year he described himself as "manager of bleachfield." After McKenzie retired David took on sole management of the business. By 1861 he was able to state that he was a "Bleacher Master employing 75 men, 9 boys and 12 women"  and by 1867 he had 350 employees. Marriage of David Cargill, Dundee Bleachworks, to Agnes Drummond, 2nd daughter of Thomas Drummond, Craigie Farm, at Craigie. Evening entertainment took place in “large new bleaching house” with 350 of Cargill’s employees. Music by Stevenson’s Quadrille Band. Mains & Strathmartine School Board – David Cargill, Chairman, presiding. Resolved to continue Downfield School as at present and to enlarge Strathmartine School to accomodate 150 pupils. At a meeting of Dundee Chamber of Commerce David Cargill raised the matter of duties on bleached yarn into France being so high as to make importation prohibitory. Mr Cargill to supply Directors with detailed information on the different rates. David Cargill, Longhaugh, was one of a number of the congregation tasked with looking for a suitable person to fill the vacancy at Mains Parish Church. A meeting of the Scottish Bleachworkers Union held at Reform St Hall to consider matters relating to 14 workmen employed by Messrs Cargill at Midmill and connected with the Union who had been dismissed and ordered to leave the houses at Parkhead belonging to Cargills where they lived. Cargills paid 14s a week to some of their workers “who were looked upon as slaves rather the workers.” Meeting resolved to strike until 14 reinstated and also demanded an increase of 5% on their wages. Some 300 to 400 workers present at a further meeting which resolved to the 14 to remain in the houses until forced to leave. Disastrous fire at Midmill. Dundee Bleachworks burned. Fire originated in one of the warehouses packed with unbleached yarn. Both steam and manual extinguishing apparatus, together with an ample supply of water, were at hand. Owing to the want of a full telephonic connection it was nearly two hours before the services of the Dundee Brigade were available. Initial firefighters were employeees of the company (about 200) and the Cargill family. Fire largely confined to warehouse so no machinery affected and work not disrupted. Loss amounted to between £6000 and £8000. First fire in 40 years of Cargill ownership. David and W. D. Cargill, bleachers, Longhaugh; David Cargill, clerk; John David, yarn saleman, Maryfield; James Nicoll, cashier; J. P. Kyd, solicitor, 1 Albert Sq and J. R. Cargill, engineer, Longhaugh. David Cargill presided over a bazaar held at the Victoria Art Gallery to raise funds for Maryfield Church. Lengthy obituary of David Cargill with portrait. Probate entry for David Cargill: Value of estate £24,549 1s 9d. hundreds of linen trade workers attracted into the growing industrial city from the declining towns in the counties of Angus and Perthshire.” Unfortunately, she did not give a more precise birthplace and David Cargill gave his birthplace as Dundee in the 1851 Census. Scotland, Births and Baptism, 1564-1950; Salt Lake City, Utah: FamilySearch, 2013. Dundee Courier 4 Apr 1867, p.2 (6). 1851 Scotland Census. Dundee. 282 ED 1, p.3, line 4. Ancestry.com. Dundee Directory 1853-54 p.144. Local Studies, Central Library, Dundee. Dundee Directory 1856-57 p.79. Local Studies, Central Library, Dundee. Dundee Courier 1 June 1900. Dundee Courier 24 Jun 1880, p.2 (6). 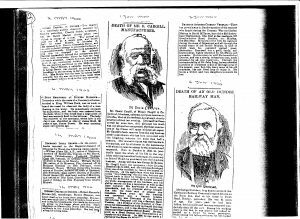 Dundee Courier 13 July 1888 p.4 (4). Dundee Advertiser 28 Sept 1894 p? 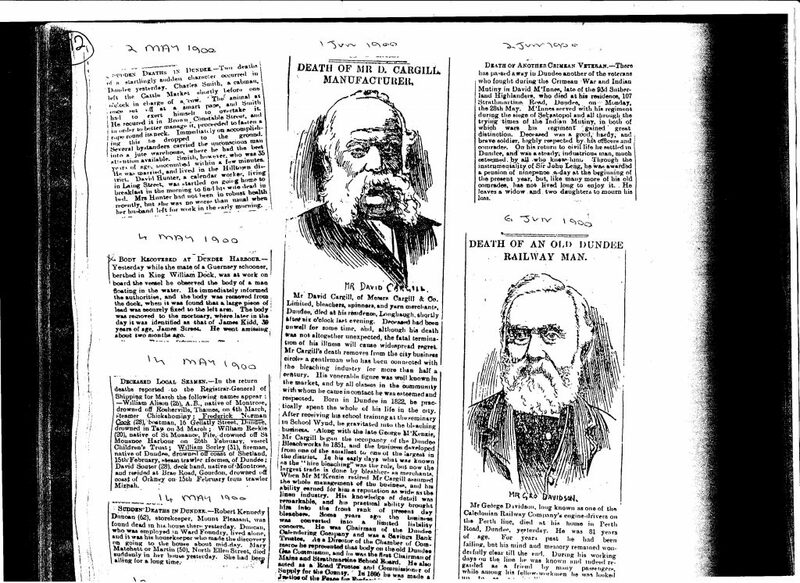 Dundee Courier 12 Nov 1874, p.3 (3). Dundee Advertiser 16 Jan 1895, p.7 (2). Dundee Advertiser 22 Jan 1895 p.2 (4). Gauldie, Enid, "The Disappearing History of the Dighty" - article with photo of some staff of Cargill & Co. in Dundee Courier 27 February 1982. Gauldie, Enid, Memories of Busy Bleachfields - article including photograph of linen yarn bleachers c.1900, in Dundee Courier, 20 February 1982. Gauldie, Enid, "The Dighty Burn and Bleachfields", substantial article at: www.ninetradesofdundee.co.uk/dyers/Waulk/. Dundee Post Office Directory 1864-65 p.105. Local Studies, Central Library, Dundee. Dundee Post Office Directory 1869-70 p.109. Local Studies, Central Library, Dundee. Dundee Post Office Directory 1871-72 p.84. Local Studies, Central Library, Dundee. 1861 Scotland Census. Mains. ED 1, p.23, line 18. Dundee Courier 16 Sept 1889, p.2. Dundee Courier 10 April 1893, p.3. Dundee Courier 21 Sept 1895, p.4 (1). Scotland, National Probate Index (Calendar of Confirmations & Inventories) 1876-1936. Ancestry website. Dundee Directory 1887 p.137. Local Studies, Central Library, Dundee. Many thanks for all their help to the staff of the local history section, central library: Eileen Moran, Deirdre Sweeney, Carol Smith, Maureen Reid, and Mr Kerrin Evans. The information above about David Cargill has been collated from a range of digital and hard copy sources. To the best of our knowledge it is correct but if you are relying on any information from our website for the purpose of your own research we would advise you to follow up the sources to your own satisfaction. If you are aware of an inaccuracy in our text please do not hesitate to notify us through our Contact page.